Reducing water consumption not only keeps a business compliant with local and state laws, it can decrease water and energy bill costs as well. But are you using water as efficiently in your business as you could be? Maybe it’s time for a water audit. What’s a Business Water Checkup? You can’t begin to cut down on your water usage unless you know how much you regularly use. A water audit helps identify your business’s everyday water usage habits. An audit also helps pinpoint leaks and identifies ways you can conserve and save even more. Conducting a water audit for your small business is easy. It’s important to know exactly how and where your facility uses water. Identify all water use points by gathering water/sewer bills; schematics and floor plans; the number of employees (and their schedules); and the capacities and water use of all appliances and water-using equipment. This will help you evaluate water-usage trends and determine all usage points. 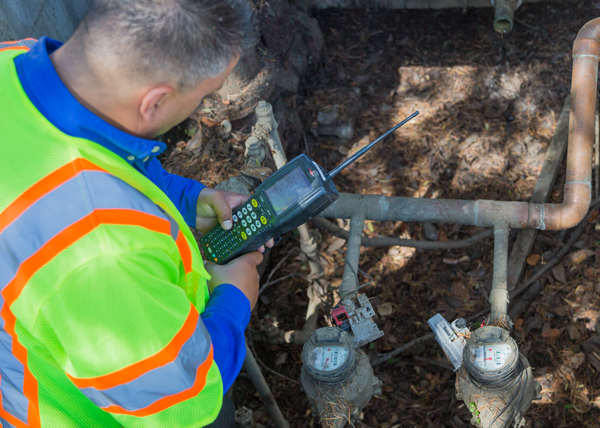 Tracking water meter readings provides a baseline for water use and helps detect leaks. First, make sure all water is turned off inside and out. Then read the meter. Wait 15 minutes, then read the meter again. If the reading has increased, you may have a leak. At a minimum, be sure to check the meter monthly. If your latest meter reading suggests a leak, do a sweep of potential trouble areas — faucets, toilets, outdoor irrigation — evaluate the problem and consider replacing old, inefficient fixtures with newer water-efficient models. Prioritize water conservation and put a preventive maintenance program in place to improve system performance and reduce overall operating costs. Be sure to check restrooms regularly for faucets that don’t shut off or valves that leak. Test cooling systems and keep irrigation systems in prime condition. 5. Plan a Program. Lead by Example. Successful water savings starts with a consistent plan and program. Even small changes can have a positive effect. If you’re looking for a fun way to get employees involved, you may even want to start a water conservation challenge. Get more water-saving tips for your business and home! Just follow us on Facebook or Twitter.